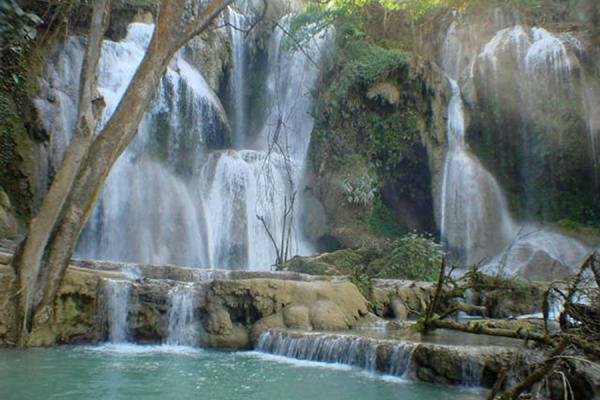 About one hour by boat or tuk-tuk from Luang Prabang, the Kuang Si Falls are a very attractive place to visit. 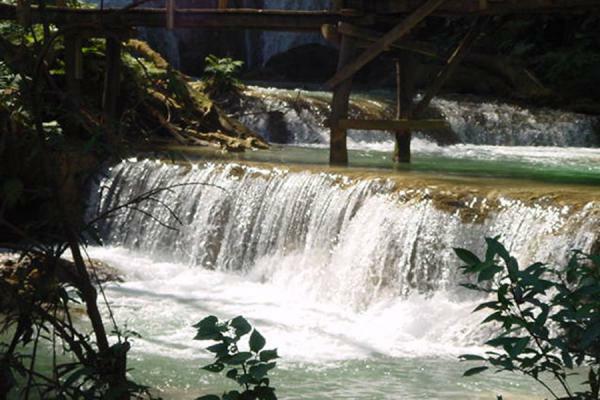 When you arrive at the bottom of the falls, it still is organized with tables and bridges. But as soon as you get higher, there are less people and the path only consists of mud and stones. At the first level you reach you can go for a swim (don't expect an Olympic size pool though). 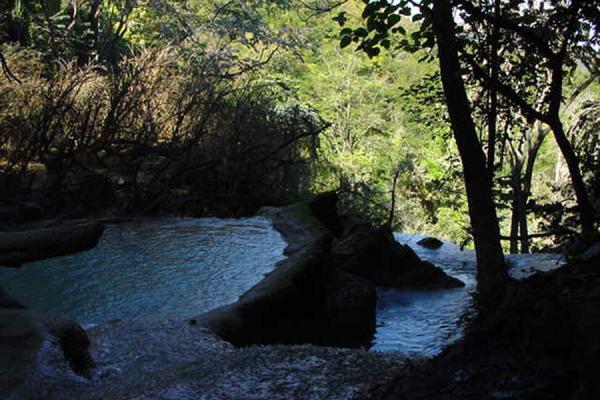 This place is certainly attractive, quiet and with a nice view of the valley and the water coming from above. The real adventure starts when you try to find the upper river. Another climb brings you higher on the hills, but then you can choose another path every hundred metres. Every path leads somewhere else, and sometimes you have to walk through mud or duck under trees hanging over the path. It took us some time to find the right path, because many paths actually lead away from the falls. When finally we found the right spot, we concluded that swimming on the lower level was more interesting and returned. Before getting back to the parking of the tuk-tuk, we could not resist the small stalls with wooden utensils and toys. Trying to be very selective we ended up taking 8 different things, most of them presents. When we headed back to Luang Prabang, we saw that those artefacts had actually been made right there. The road to the falls is interesting as are the falls themselves, passing several bridges and a dusty road. 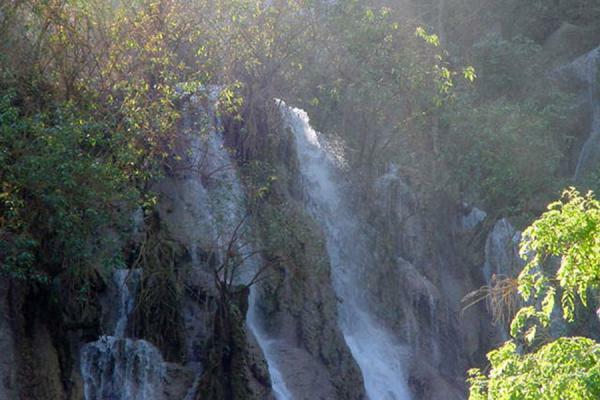 Personal travel impressions both in words and images from Kuang Si Falls (). Clicking on the pictures enlarges them and enables you to send the picture as a free e-card or download it for personal use, for instance, on your weblog. 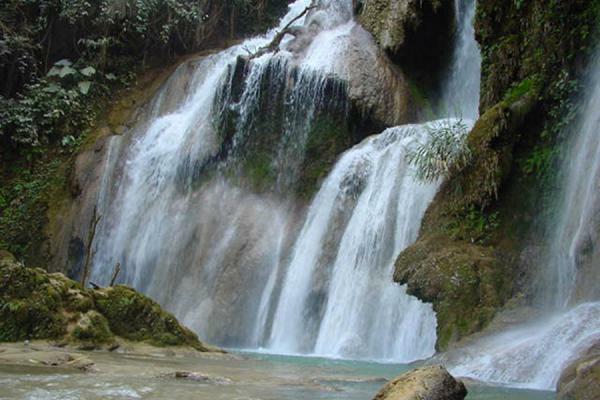 Or click on the map above to visit more places close to Kuang Si Falls. 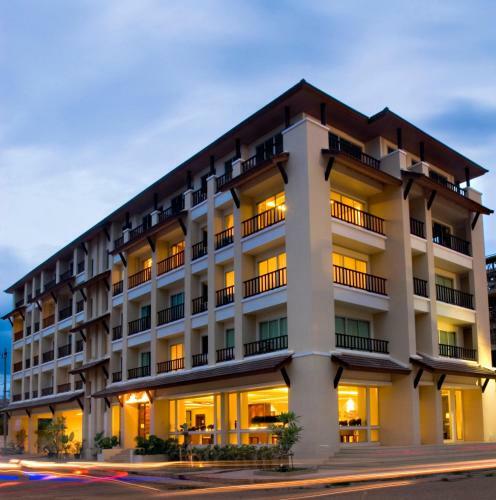 Book a hotel near Kuang Si Falls, Kuangsi Falls, Laos with low prices for all kinds of hotels - without reservation fees.